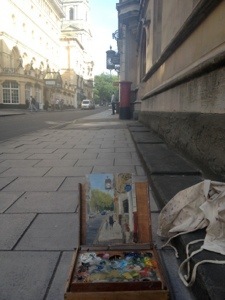 Here’s a plein air painting I did in Broad St in Bristol that I’ve entered into the Bristol Art Prize. You can see all the entries on-line, some of the plein air work is jaw dropping. I think it took around two hours when I had to stop as a was getting cold and hungry after being sat in the shade for so long. It’s got a slightly streaky paint quality, the board I painted on had a quite slippery w&n oil primer so the paint slid around a bit. The exhibition will be at the Guildhall, which is just behind where the painting was painted from and will be on during October, it’s a judged show so hopefully I’ll get a couple in. The clock is hanging outside the former Leeds and Holbeck Building Society. I enjoyed the process and got a few encouraging comments from some of Bristol’s harder drinking street residents, I’d not painted anywhere quite that public before. With hindsight I wish I’d been brave enough to ask one of them to sit for a portrait in situ, it would certainly stand out in the online gallery and put my discomfort to shame. If it runs again in Bristol next year I resolve to ask if the opportunity arises and see what happens. 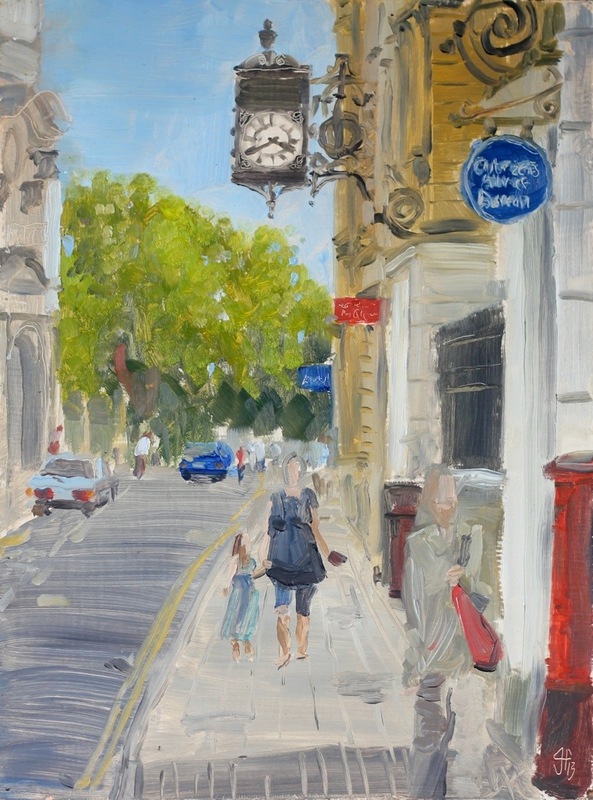 This entry was posted in recent work and tagged oil painting, plein air by ianpriceart. Bookmark the permalink.